In the 1960s, after leading protest campaigns to expose discriminatory hiring and pen thousands of jobs to African Americans, the Reverend Leon Sullivan (1922-2001) founded the Opportunities Industrialization Center (OIC), a vocational, educational, and life skills training program designed to prepare young men and women for full-time employment. Moving beyond protest to address the barriers of poverty and oppression, the OIC quickly expanded into all corners of the city and ultimately grew into a national and international movement that trained millions of workers from all racial and ethnic backgrounds. The OIC first opened its doors on January 26, 1964, inside a refurbished jailhouse at Nineteenth and Oxford Streets. The building, emblematic of the area's urban decay, became a potent symbol of hope in North Philadelphia. The OIC's skeleton-key logo promised "To Open Any Door" and proudly proclaimed Sullivan's self-help motto, "Helping People Help Themselves." Trainees started in the "Feeder Program," which sought to eliminate the stigma of remedial education by confronting the candidates' learned sense of racial inferiority. Students took courses in African American history to develop a deeper appreciation for their heritage and to cultivate a new sense of self-esteem, identity, and pride. Building on this newly fortified base, students received supplemental instruction in communication skills, basic reading, writing, arithmetic, consumer education, interpersonal relationships, and personal hygiene. Candidates then progressed to the OIC Technical Skill Center for training in a wide variety of manufacturing jobs. Sullivan extolled the virtues of OIC trainees, negotiated with businesses to hire them, and cultivated additional financial and instructional support from corporate leaders. OIC's early years were challenging. Funding came from a patchwork series of donations from parishioners at Zion Baptist Church. At one point, Sullivan and his wife, Grace (1924-2011), took out a loan against their home to make payroll. Ironically for a self-help program, a massive infusion of federal and philanthropic funding helped stabilize and expand OIC beyond Philadelphia's borders. In March 1964, a $200,000 grant from the Ford Foundation provided vital funding. In December, OIC received a $458,000 grant from the Department of Labor to administer job training and education programs. 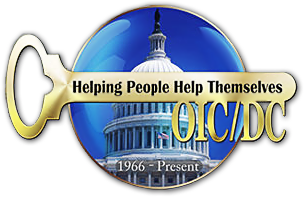 In the summer of 1965, OIC won the support of Lyndon Johnson (1908-73) and his War On Poverty and received a $1.7 million dollar grant from the Office of Economic Opportunity (OEO).